You know a lot about MP3, FLAC, WAV, and others. But what about some more niche formats, used by specific recording studios and compression technologies. 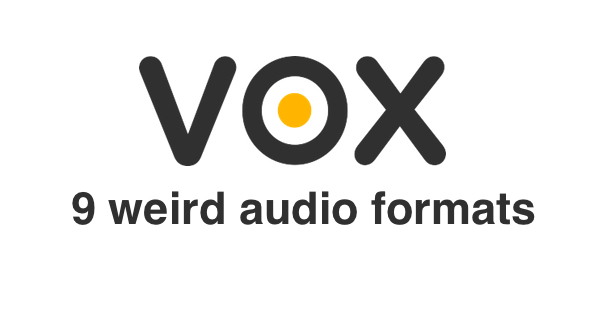 Here's a list of the least popular audio formats that VOX Music Player can play. Most of these were created specifically for arcade games, and old game consoles. Modular audio file format that is similar to other MOD formats, such as .MOD, .XM, and .S3M; however, MO3 files contain samples compressed with .MP3 or .OGG audio compression and also use a compressed file structure; allows higher-quality samples to be used while significantly reducing the file size. Music module format that contains background music for Unreal Tournament, a 3D first-person shooter; similar to an .XM or .S3M file, but is saved in the proprietary Unreal music format; can be opened using various audio trackers and Unreal utilities. Universal audio tracker module format that is similar to a .MOD file; contains sound samples and a musical score for playback; supports up to 32 channels, which allows many samples to be played back at once. Audio file used by games from older computer systems that had a General Instruments AY series sound chip; contains a "chiptune," which specifies a sound format that enables the sound card chip to create sounds in real time; can be played back using a program that emulates the AY sound chip. AY files were commonly used by Amstrad CPC (Colour Personal Computer) games, which were developed in the 1980s. They were also used by Spectrum ZX games and Atari ST games. Music file from an original Nintendo (NES/Famicom) game; allows music from Nintendo games to be played without loading the actual game; can be opened by a variety of NSF players. Audio file commonly used by older Atari systems that have the POKEY sound chip; contains a "chiptune," which specifies a sound format that allows the sound card chip to synthesize and sequence sounds in real time; used for playing back video game music. SAP players emulate the Atari 8-bit computer architecture and POKEY sound chip in order to playback SAP files. Audio file extracted from SNES (Super Nintendo Entertainment System) video games; contains a 16-bit, 32KHz soundtrack; often extracted from an SNES ROM using an SNES emulator. SPC files are used for listening to SNES soundtracks with an SPC audio player. SPC stands for "SPC700," the name of the sound chip that is included in SNES games consoles. Audio file used by some Yamaha and Texas Instruments sound chips that were included with older video game systems; contains video game audio that can be synthesized by the sound chip; can be played with computer software that emulates the sound chip. VGM files were used for game consoles such as the Sega Genesis, Sega Game Gear, and Capcom arcade machines.